Having speakers come to campus is always a highlight and I have written a blogpost on "Tips for Organizing a Successful Speaker Series," which is one of my most popular ones. Guest speakers also add tremendous value to a course! This semester, I am offering, for the second time at UMass Amherst, a course on Humanitarian Logistics and Healthcare, with the syllabus available here. The course has attracted students from the Isenberg School of Management, the School of Public Health, and the College of Engineering. One of the highlights of the course is the speakers that come to share their experiences with our students. But, of course, scheduling speakers is a logistical exercise, because not only is it important to have them come when it makes sense in the course curriculum, but also practitioners in the space of disaster preparedness and emergency response are very busy people! I am absolutely delighted that, in February, the students in my class will have the opportunity to hear from 4 experts: the new Director of Emergency Preparedness and Business Continuity at UMass Amherst, the Executive Director of the Red Cross of the Pioneer Valley, a renowned doctor from the University Health Services who has done relief work in Haiti, post the devastating earthquake, and also saved lives at the Boston Marathon bombing on April 15, 2013, as well as a top TV anchor from western Massachusetts! The positive response to my invitations has been overwhelming and the speakers have agreed, despite scheduled surgeries, and other professional and personal obligations, to share their knowledge and wisdom with students. 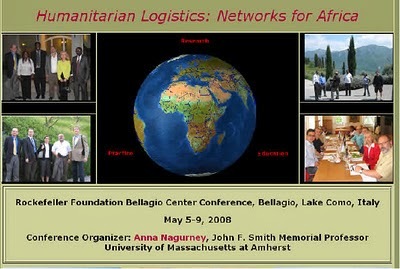 One of my greatest challenges in terms of bringing speakers together (all at the same time) was the Humanitarian Logistics: Networks for Africa Workshop that I organized on behalf of the Rockefeller Foundation's Bellagio Center program back in May 2008. This workshop, which took place at the Rockefeller Foundation's Bellagio Center on Lake Como in Italy, was (unplanned) situated between two major disasters: Cyclone Nargis that hit Myanmar/Burma and the Sichuan earthquake in China. This workshop was one of the most stimulating workshops that I have had the honor to be part of with experts from academia (from 3 continents), practitioners from the UN and CSIRO, and humanitarian logisticians with amazing experiences from the field! My final report on the workshop to the Rockefeller Foundation is available here. I will be sharing what we learn from the outstanding speakers in my Humanitarian Logistics and Healthcare class. At this point, I want to acknowledge them and to thank them for taking the time out of their extremely busy schedules to come to the Isenberg School to share their vast knowledge and experiences on various aspects of emergency preparedness and response. I asked my students yesterday the question: "Whom Have You Helped?" and told them that one of the themes of the professional society INFORMS (Institute for Operations Research and the Management Sciences) that I belong to and have benefited from greatly is Doing Good with Good O.R. (Operations Research). A great question to answer and live by every day: "Whom Have You Helped?" The weather outside is frigid but there is a lot of energy and warmth around indoors with the beginning of the new academic semester. I have been more than busy since I am teaching two classes that I am very excited about and am also serving on a search committee for a faculty position in Systems Engineering. It is always fascinating to hear faculty candidates present their research! I've been bringing my doctoral students to these "job" talks since one can learn a lot from them. At the Isenberg School we have two upcoming events, which are not for women only. On Saturday, February 8th, in our lovely Isenberg atrium, the Inaugural Women in Business Isenberg conference is taking place. It is being organized by the Isenberg Women in Business Society. More information is available here. I am especially delighted that Christina Calvaneso will be coming back and will be a panelist. Christina worked as a Student Center Associate at the Virtual Center for Supernetworks that I founded and did such a great job that I nominated her for a Leaders of the 21st Century Award, which she received from UMass upon graduation. Her area of concentration was Operations Management. 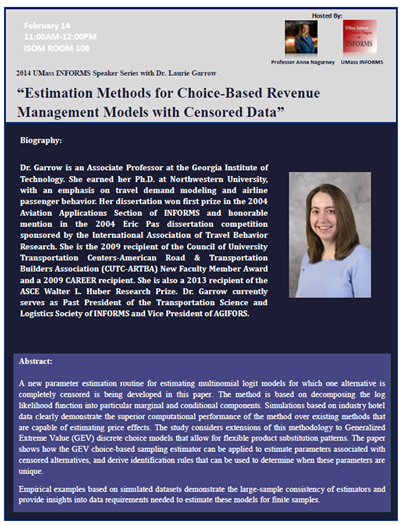 Also, on February 14th, which is Valentine's Day, the UMass Amherst INFORMS Student Chapter and I will be hosting Dr. Laurie Garrow of Georgia Tech in our UMass Amherst INFORMS Speakers Series. The notice is below. More information on Dr. Garrow can be found here. Come join us for refreshments at 10:30AM preceding Dr. Garrow's presentation at Isenberg Room 108. How Was Your First Day of Classes? I very much like the rhythm of the academic life with semesters supporting the year and with class schedules. Yesterday, was the first day of the new "Spring" 2014 semester at UMass Amherst and a pending snowstorm hitting the northeast of the U.S. added to the excitement (spoiler - no cancellations in our area today). I was so surprised and pleased to see several of my Operations & Information Management majors stop by to say "hello", who had taken by Logistics & Transportation class last semester, and who had fulfilled their graduation requirements. It is always great to see former students! Yesterday, I had a busy first day of classes, beginning in the morning with my Humanitarian Logistics & Healthcare class and, in the afternoon, my Management Science Seminar, which this year is focusing on Variational Inequalities, Networks, and Game Theory. Yesterday was also my daughter's birthday and somehow she made it, after a long flight to Newark from Hawaii, where she had taken an intensive science course, via Amtrak to New Haven, from where she then got a ride (there were many upset passengers at the New Haven train station since an Acela from Boston had broken down). She said that she was going to make it home even if she had to walk. I had visions of Steve Martin's movie, "Planes, Trains, and Automobiles." And, yesterday, January 21, one of my former doctoral students, who is now a professor, celebrated the birth of his first child with his wife, a daughter (and I predicted the day). This will be a very exciting semester! With best wishes to everyone on all of your endeavors. 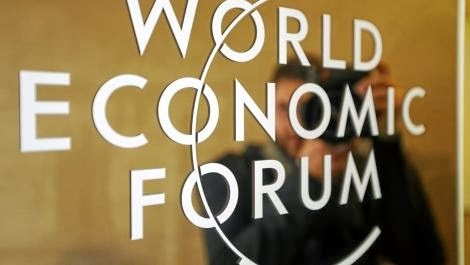 The 2014 World Economic Forum Annual Meeting takes place this week in Davos, Switzerland, January 22-25. The theme this year is The Reshaping of the World: Consequences for Society, Politics and Business. It's always interesting to see who will be coming to Davos from heads of state, to executives, to various thought leaders, academics, and humanitarians. Just like one of my favorite professional societies, INFORMS (Institute for Operations Research and the Management Sciences), the World Economic Form (WEF) also has Communities. I am very pleased that operations researchers are represented in two of the communities that I am familiar with. Interestingly, I could identify 3 WEF individuals who are operations researchers and they are all in transportation & logistics! If any of my readers know of other operations researchers, please let me know -- thanks! and Dr. Dirk Helbing is also on the WEF Global Agenda Council! It is not far from Zurich to Davos! You can find all the WEF global agenda council members here (alphabetized, for some reason, by their first names). The World Economic Forum in January 2013 produced a nice report on Building Resilience in Supply Chains , in collaboration with Accenture. In it, you will see not only Yossi Sheffi's name but also Dr. Jose Holquin-Veras' of RPI. We hosted Dr. Holguin-Veras in our UMass Amherst INFORMS Speaker Series at the Isenberg School and I last saw him in Gothenburg, Sweden, where I hold a Visiting Professorship at the University of Gothenburg. He also was a panelist with Dr. Laura McLay, Dr. Panos M. Pardalos, Dr. Tina Wakolbinger, and Dr. David McLaughlin at the Dynamics of Disasters symposium last February that I organized in Boston for the AAAS Annual Meeting. Another World Economic Forum community is that of the Forum of Young Global Leaders and, among the group selected in 2013, is Dr. Soulaymane Kachani, who is originally from Morocco. He received both his Master's and PhD in Operations Research from MIT. I am a bit biased since his dissertation advisor was Dr. Georgia Perakis, who is technically my "academic sister," since she was a PhD student at Brown University working for Stella Dafermos (who was my advisor there, too) but then Stella died, so Dr. Tom Magnanti of MIT helped her to complete her PhD. Her PhD is from Brown. Dr. Kachani is now a Vice Dean at Columbia and is in the Department of Industrial Engineering and Operations Research. Columbia had issued this nice press release on his participation in the WEF. He is a great choice. He was my host when I spoke at Columbia, in September 2006. I gave a seminar ther on Dynamic Networks in the Industrial Engineering and Operations Research and Decision Science, Risk and Operations Series. You can nominate a World Economic Forum Young Global Leader for 2014 here. Isn't it great to have operations researchers on the world stage?! Best of luck to everyone at the WEF in Davos. I am a big fan of Professor Braess' work and his paradox paper, which was written in German and published in 1968. I not only wrote about it in my doctoral dissertation, but have enjoyed building upon it since. Plus, I had the distinct honor, along with my doctoral students and the UMass Amherst INFORMS Student Chapter, of hosting Professor Braess' first visit to the U.S., back in April 2006, to speak specifically on his paradox. In addition, we were celebrating the translation of his paper from German to English, which Braess and I did, along with my doctoral student from Austria, Tina Wakolbinger, who is now a Full Professor in Vienna. The translation was published in the INFORMS journal, Transportation Science, along with a preface, written by Professor David E. Boyce and me. The photos of Braess below were taken at the Isenberg School and at the University Club. The photo immediately above was taken in my Supernetworks Lab at the Isenberg School. Professor Braess, Tina, and I are holding our translation in Transportation Science. Additional photos as well as a link to Professor Braess' presentation can be found on this page. Professor Braess wrote me that New Scientist was writing a story on the paradox, which has just appeared and is by Justin Mullins. It is entitled: "42nd St paradox: Cull the best to make things better" and a preview is here. I managed to access a copy, although the official publication date is not until January 18, 2014. The article also notes Skinner's work vis a vis basketball and the Braess paradox, which I spoke about in the PBS America Revealed segment Gridlock (a great experience to be interviewed by the winner of Survivor in 2006, Yul Kwon!) and have written about on this blog. New Scientist also mentioned Professor Adilson Motter of Northwestern University, who led the recent Network Frontiers Workshop in December that I spoke at on Envisioning a Future Internet.Architecture. Motter is quoted in the New Scientist article on his ecology work (networks are everywhere! ): In certain circumstances, the early removal of a species that would otherwise eventually go extinct anyway can prevent all secondary extinctions and improve the entire system's viability. That's an analogue of Braess's paradox, says Motter. The New Scientist article also talks about Professor Dirk Witthaut's work on the electric grid and concludes: It is very early days in our understanding of biological networks. But if Motter, Witthaut and others have their way, counter-intuitive network effects may have a much more significant role to play in future. It may even be the key that helps the Knicks to another NBA play-off, and perhaps even reunites them with the championship trophy that has long eluded them. And speaking of the Braess paradox, I have posted below a link to the video captured at the great UMASS Amherst TEDx event at which I spoke on The Traffic Circle of Life and, of course, the Braess paradox! Anna Nagurney from TEDxUMassAmherst on Vimeo. The lecture slides can be downloaded here. Welcome Back, Coach Mark Whipple, to UMass Amherst Football! I watched the press conference, with great speeches by the President of UMass, Dr. Robert Caret, the Head of the UMass Board of Trustees, Henry M. Thomas III, followed by the introduction of the "new" UMass Amherst football coach, Mark Whipple, by our Athletic Director, John McCutcheon. I do follow sports, which are a marvelous diversion at this time of the year in New England (with great basketball, hockey, and even the figure skating championships in Boston recently). I also needed a break from working very intently on my course lectures for two courses that I will be teaching at the Isenberg School of Management, with the new semester beginning on January 21! What Mark Whipple said in such a heart-felt manner, moved me so much, that I had to comment. First, Mark Whipple is a Brown University alum (as am I) so I am a bit biased. Second, Mark led UMass Amherst, when it was in a different conference, to a national championship and has had a fabulous career since with stints in the NFL and elsewhere. Whipple began his press conference today with tears in his eyes and was literally choked up. This was truly moving. He stated that sometimes you have to leave to find out where your home was, and, by this, he meant, UMass Amherst. He said, which I loved: "I am a teacher. I am an educator." He wants to impart his wisdom to the players, which he certainly will, given his wealth of experiences in collegiate and professional football! He noted that college football is a "people's business" and that "it's all about the people. It's all about the players." He thanked his wife and his two sons and noted that coming back to UMass was a family decision. He emphasized what collegiate sports contribute to education and to athletes. I truly believe in the value of collegiate sports in terms of building discipline, organizational skills, and fitness. Back in my Brown University days, I ran on the Women's Track and Field and Cross-Country teams. Mark Whipple noted, in his press conference, that he "loves jewelry," which means those championship rings which he has a box full of. Mark Whipple said that "everything moves forward" and "Go, UMass!" UMass Amherst is "Back to the Future" and we wish Mark Whipple all the very best and thanks! When I started this blog, with the first post on January 19, 2009, I never thought that 5 years would pass by so fast and that there would be so much to write about and to comment on! This is my post #1,210, which comes out to 242 posts a year! Just for fun, I have included a jpg of my very first post below. I was cautious and not very expressive then -- I have changed. What continues to amaze me is the comments that I get from my readers, whether through emails or in person, which express appreciation for the advice that I have shared, along with helpful hints, on topics ranging from leadership to advocacy (from Operations Research to Women to the Environment) to handling rejection (of papers, that is) to interviewing skills to even how to organize speaker series and to do research. I have tried to also cover different events, ranging from conferences to disasters (both local and far afield) as well as travel experiences and education in different parts of the world, and to highlight people who inspire. And, since networks are my passion, I have aimed to share with you fascinating discoveries and applications from supply chains to transportation and even the Future Internet, financial networks, and humanitarian logistics. What has made the past 5 years so exciting, is the communities that I have enjoyed being part of and the people that I have met through thousands of miles of travel. My readers come from almost all continents (except Antarctica -- if anyone from Antarctica is reading this, please email me). I hope that the information that I have provided has been entertaining and useful. I have heard from CEOs, other executives, journalists, government officials, university administrators, heads of educational institutions, numerous practitioners, scientists, academics, students, alums, neighbors, friends, colleagues, and even artists, authors, and athletes about what I have written that has captured their interest. I appreciate the many thanks, which makes the effort and thought that goes into writing so worthwhile. I am grateful to my readers and to the very special community of fellow bloggers in Operations Research and beyond who always provide encouragement and interesting feedback and discussion! We certainly live in fascinating times! Let's keep on blogging - we can change the world! Dr. Les Servi, who presently works at Mitre, and I go back to our Applied Math student days at Brown University and both of us have continued to work in operations research and its many exciting applications over the years. The UMass Amherst INFORMS Student Chapter and I had the pleasure of hosting his talk and visit in November at the Isenberg School of Management and, as I wrote on this blog, he was terrific! After his presentation, he mentioned that he had proposed, and it was approved by INFORMS, a new subdivision, the INFORMS Social Media Analytics Subdivision, with him as the Founding Chair. The good news is that this division is now "live" and I received the message below from Dr. Servi to disseminate this good news. Of course, it is not just for students, and more info is in his message, which I am sending out for communications purposes, and since I was asked to. Best of luck on this exciting new initiative! After many months of planning today begins a membership drive for a new INFORMS Social Media Analytics Subdivision. Dues are $6/yr. More information about the subdivision (as well as instructions about joining) can be found at https://www.informs.org/Community/Social-Media-Analytics/How-to-Join-the-Section. Every now and then there is a singular opportunity to get involved with something new and exciting at its creation and to shape it into something great. I believe becoming a founding member of this INFORMS subdivision is such an opportunity. INFORMS is uniquely positioned to be a central hub for Social Media Analytics as an organization which brings together over 10,000 members who are technical strong, who representing the best in the world in a number of diversity fields, and whose interests range from pursuing pure theory to pursuing the applied, with many doing both. As a student this is a chance to join early to participate, help guide, and a eventually help lead this new subdivision. Speaking personally, around 20 years ago I became a founding member of the Telecommunication Subdivision and it was a pleasure to have a front row seat watching it grow from nothing to part of the INFORMS establishment. After the membership drive I will be organizing a social media analytics cluster of talks for the INFORMS national meeting cf http://meetings2.informs.org/sanfrancisco2014/index.html There will be well over 2,000 people attending this conference. People interested in presenting a talk should contact me. The key to the success of this subdivision is great momentum in its first year. With many members and a cluster of talks as many and as good as last fall's cluster we will be well on our way. - Social media service providers (who might eventually permit the sharing of anonymized data for purposes) and researchers to promote the exploration of new algorithms. Please join and encourage people in your network to join. Yesterday's Sunday New York Times was waving the flag for operations management and operations research and management science. In the Sunday Review section there was a timely OpEd by Drs. Kevin Volpp and Katherine Milkman, "How to Keep Your Resolutions," which cited their forthcoming article in Management Science, which I tracked down with the very catchy title of: "Holding the Hunger Games Hostage at the Gym: An Evaluation of Temptation Bundling." This article offered 4 tips from behavioral economics and health on how to keep your New Year's resolutions. But another article also caught my eye - it was in the magazine section and was entitled in my hardcopy version: "A Ready-to-Assemble Business Plan" and in the online version (no idea why the title changed) "Thinking Outside the (Big) Box," by Adam Davidson It began with Davidson describing a trip to Ikea in Brooklyn with his wife (readers of my blog know that I love Sweden and Scandinavia and have held multiple visiting professorships there) that he said might cost him his marriage. This was a while back and was due to what he said was the lack of available sales staff to answer questions. Well, times have changed, at least for some big box stores and their employees (and I won't in this post, revel in our great experiences of visiting Ikea when our daughter was 2, and we lived in Stockholm -- just last week, and now a teenager, she was missing Swedish meatballs with lingonberries, which we dined on last summer but in Gothenburg). Davidson and his wife did not have this meal in Ikea (perhaps they should have). 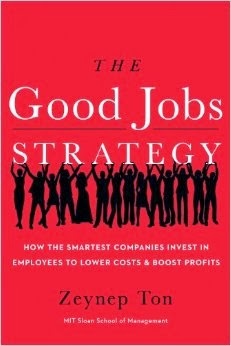 Adam Davidson's article focused on the work of Dr. Zeynep Ton, whose book, The Good Jobs Strategy, was just published and in it she argues how treating retail employees much better may make everyone (including their employers) much richer (contrary to conventional thinking). Dr. Ton had worked in her father's apparel factory in Turkey, sewing on pockets to garments. Nothing like a difficult job to instill the value of education and good working conditions. (I worked summers as a nurses' aide while in college (Brown University) and had lots of practice emptying bedpans but I loved the interactions with my patients, especially the elderly ones, as well as the esprit de corps among the nursing staff). And what do you think of the following provocative sentence by Davidson in his article: "In the last few years, Ton has become a revolutionary force in a field that would seem unlikely to generate many -- the Kafkaesque-titled Operations Management." I read a lot of Kafka (as well as Dostoevsky) as a teenager and now am propitiously a chaired professor of Operations Management. Davidson goes on to note a study by Professor Marshall Fisher at Wharton (Volpp and Milkman also have appts. there), which noted that, for every dollar of increased wages, one retailer that was studied brought in $10 more in revenue but for more understaffed stores in the study, the boost was as high as $28. Davidson mentions that the software that is typically used considers workers as a "cost" and does not quantify the "profit" potential in terms of customer service, value added, and quality of experience, if I may. This shows, also, the importance of selecting the right objective function that you are optimizing (or trying to)! Since I am a researcher, I had to dig deeper and located the article that Fisher wrote that was co-authored and it is: Marshall L. Fisher, Jayanth Krishnan, Serguei Netessine (Working), Retail Store Execution: an Empirical Study, and you can read it online here. It does have the dollar figures as noted in the Davidson article above. More information can be found in Fisher and Raman's book, The New Science of Retailing: How Analytics are Transforming the Supply Chain and Improving Performance, which includes results for the Fisher et al. study. Now, and this is Kafkaesque (and not found in the New York Times piece), Dr. Zeynep Ton, who received her undergrad degree at Penn State and her DBA at Harvard Business School, is an Ajunct Associate Professor at the Sloan School at MIT, and she was denied tenure at Harvard Business School where she was a very popular faculty member -- you can read more about what transpired in this article, HBS Loses 'Rock Star' Prof to MIT, posted on the Poets & Quants website. According to the article: Despite her sterling reputation in the classroom, Harvard decided not to promote the assistant professor who had been at the business school since 2002. The decision was a surprise to many on campus given her widespread popularity. Indeed. some students could be seen crying in the classroom when she taught the last session of a supply chain elective course. In September, I wrote a post, Some of the First Years Had Never Had a Female Professor -- Gender Ineqality at Harvard Business School. Perhaps Harvard will now bring back Dr. Zeynep Ton to its Harvard Business School faculty, given the visibility of her new book! Or MIT will give her tenure! And, for those who are interested (and still reading), you can listen to Dr. Ton in her TEDx presentation. My most recent post on this blog was on networks in mergers and acquisitions and shortly thereafter there was a very interesting acquisition announcement in the cybersecurity space: FireEye acquired Mandiant Corp. This is considered one of the biggest recent security deals as reported by The New York Times, which noted that The combination of the two companies — one that detects attacks in a novel way (FireEye), another that responds to attacks (Mandiant) — comes as corporate America has become wary of relying on the federal government to monitor the Internet and warn of incoming attacks. And according to The Wall Street Journal: Mandiant and FireEye market themselves to businesses, not consumers, and focus on blocking highly skilled hackers who can evade traditional antivirus software. But they have unique specialties. Mandiant has become famous for its investigators that act like a cyber-SWAT team for companies that have been hacked. They focus on figuring out how hackers got in and removing them from corporate systems. Mandiant is named after its founder, Kevin Mandia, who also served as the company's CEO prior to its acquisition. According to the company's website: Mandia was profiled on the cover of Fortune magazine and recognized by Foreign Policy magazine as one of the 100 leading global thinkers of 2013. The New York Times a few months ago had major coverage of the expertise of Mandiant which was fascinating. Mr. Mandia went to Lafayette College, in Easton, PA, which is also my husband's undergraduate alma mater. From an article on Lafayette College's website, I learned that Kevin Mandia was a computer science graduate, and also holds a Master’s in forensic science from George Washington University. He is co-author of Incident Response: Investigating Computer Crime and articles for The International Journal of Cyber Crime. I became interested in cybersecurity and cyber crime in my research on modeling the Internet and was involved in an Advanced Cyber Security Center (ACSC) project, Prime the Pump, entitled: Cybersecurity Risk Analysis and Investment Optimization with colleagues in Operations & Information Management and in Finance at the Isenberg School of Management, and in Electrical and Computer Engineering, at UMass Amherst, along with one of the university's chief information officers. I presented some of our funded research at the INFORMS Annual Meeting in Minneapolis last October and posted some information prior to the conference. Our session, organized by Professor Alla Kammerdiner, was entitled: Big Data Analytics for Cybersecurity, and it was videotaped. INFORMS recently posted the video of my presentation: Network Economics of Cyber Crime with Applications to Financial Service Organizations on INFORMS' great youtube channel and it can be accessed directly below. We hope to extend this and related work through the auspices of ACSC. Also, Alla's presentation was on Network Inference for Monitoring Cyber-physical Systems (CPS) and it can be viewed below. Alla ran the Boston Marathon last April 15 and is an elite runner. She heard about the bombings after she completed the marathon route and while on the Green line traveling back to her hotel. Today's New York Times has an article, "U.S. Merger Activity in '13 Back at the Trillion-Dollar Level," by David Gelles, which immediately caught my attention. My supernetwork research group has been working on modeling potential synergies associated with Mergers & Acquisitions (M&As) using networks in order to ascertain whether a pending deal may be worthwhile or costly. 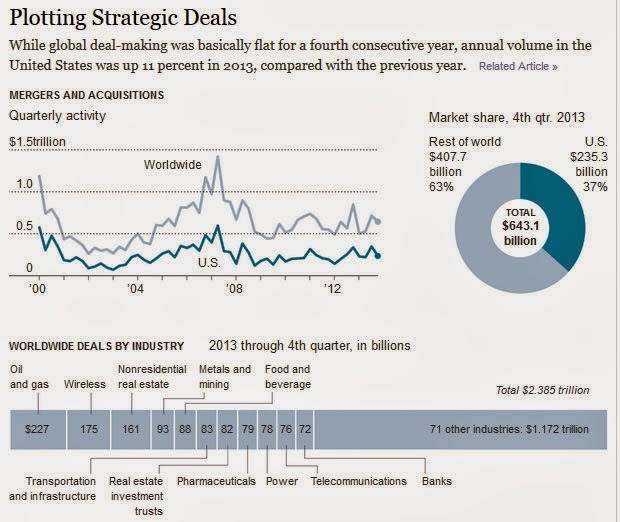 First, you may notice that many of the industries that were especially active with respect to M&As in 2013 are actually network industries (wireless, transportation and infrastructure, power, telecommunications, and I would argue even banks as financial networks). Hence, it makes (alot of) sense that any quantification of possible synergies associated with mergers and acquisitions should be network-based. Interestingly, a few weeks ago, I was interviewed for a piece by Mark Huffman on cardhub.com in its Ask the Experts series on the topic: Should American Airline, US Airways Merger Be Blocked? The merger did go through. The comments on the Times article by readers were also quite good and several alluded to criteria associated with M&As (and not just having the lawyers earn $$$ from the deals). In our work on M&As, we have pursued not only criteria of (possible) cost reduction but also risk reduction as well as environmental impacts. Some of our papers are noted below with associated links: A System-Optimization Perspective for Supply Chain Network Integration: The Horizontal Merger Case, Anna Nagurney, Transportation Research E 45: (2009) pp 1-15. Environmental and Cost Synergy in Supply Chain Network Integration in Mergers and Acquisitions, Anna Nagurney and Trisha Woolley, in Sustainable Energy and Transportation Systems, Proceedings of the 19th International Conference on Multiple Criteria Decision Making, Lecture Notes in Economics and Mathematical Systems, M. Ehrgott, B. Naujoks, T. Stewart, and J. Wallenius, Editors, Springer, Berlin, Germany (2010) pp 51-78. Risk Reduction and Cost Synergy in Mergers and Acquisitions via Supply Chain Network Integration, Zugang Liu and Anna Nagurney, Journal of Financial Decision Making 7(2): (2011) pp 1-18. Formulation and Analysis of Horizontal Mergers Among Oligopolistic Firms with Insights into the Merger Paradox: A Supply Chain Network Perspective, Computational Management Science 7: (2010) pp 377-401. 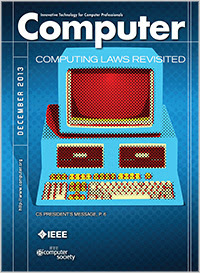 The December 2013 issue of IEEE"s Computer magazine has as its theme: Computing Laws Revisited. Our hardcopy issue (my husband is a subscriber) arrived yesterday, on New Year's Eve, and, today, New Year's Day, I sat down to read the article, "Metcalfe's Law after 40 Years of Ethernet," written by none other than Bob Metcalfe, Ethernet's inventor, himself. The Ethernet is the physical transport level of today's Internet. On May 22, 2013, Ethernet industry leaders gathered at the Computer History Museum in California to celebrate its 40th birthday and to catch up on what has become a $100 billion industry (do I now have your attention?). I have been interested in Metcalfe's Law since, as an Associate Editor of over a dozen journals, and a frequent reviewer of journal articles, as well as a Co-PI on a Future Internet Architecture NSF grant: Network Innovation Through Choice (which I most recently spoke on at the Network Frontiers Workshop at Northwestern University), I not only encounter related controversies but also write and review papers that touch upon this law. I guess that Metcalfe must have been reading over my shoulder! Now, back to a controversy: In 2006, Briscoe, Odlyzko (I do like some of his math models a lot), and Tilly published an article, "Metcalfe's Law is Wrong" in the IEEE Spectrum, which you can read online without a subscription. These authors described Metcalfe's Law as both "wrong" and "dangerous." So, what is Metcalfe's law, you may be asking (for those not so much into hardware). 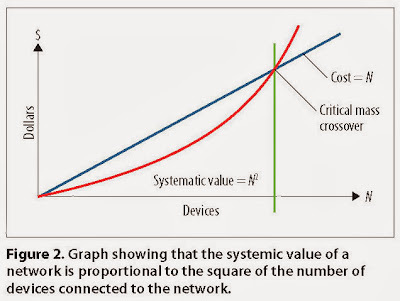 As explained by Metcalfe himself in his very clear and erudite December Computer magazine article: The "law" bearing his name states that the value of a network grows as the square number of users: V= NxN. The law started as a high-concept Ethernet sales tool in the early 1980s and entered into the public discourse in the new millennium when Gilder "championed" Metcalfe's law in his book, "Telecosm: The World After Bandwidth Abundance," published in 2000. 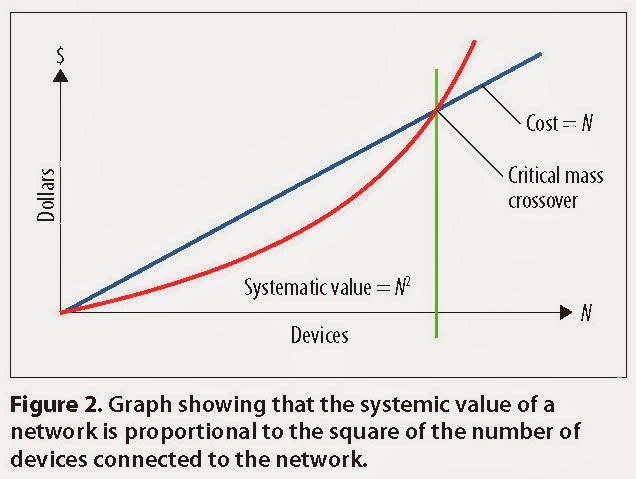 During a presentation to the 3Com sales force (Metcalfe cofounded this company in 1979), Metcalfe showed the figure below (thanks to his article in Computer magazine) to argue that if a network is too small its cost exceeds its value, but if a network gets large enough to reach a critical mass, then the sky is the limit. 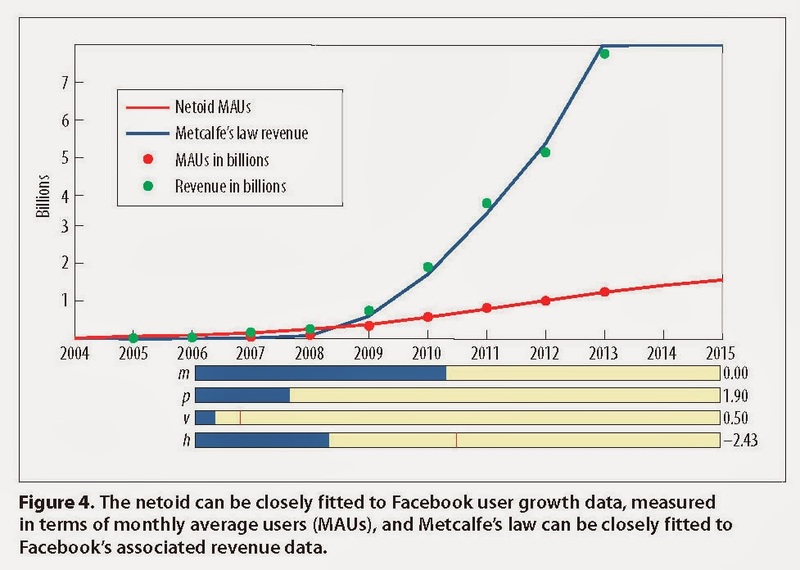 Valuation of Internet-based companies such as Google, LinkedIn, Facebook, Twitter, Snapchat, and others is clearly important and detractors have said that Metcalfe's law may be overvaluing such firms. The main critique of Metcalfe's law, noted by Metcalfe, himself, was that Briscoe, Odlyzko, and Tilly countered that not all network connections are of equal value and that the growth in the value of a network is approximately Nxln(N) and not NxN as Metcalfe had stated. Moreover, neither "law" had been validated empirically until Metcalfe did recently and reported the results in his article in the December issue of the IEEE Computer magazine. And he used 10 years of real data from Facebook and fitted the data looking at N as a function of time. To estimate the growth of users and individual groups of friends, he first applied a sigmoid function (S-shaped adoption function). He then generalized it to what he calls a "netoid" function using the Python programming language. (It looks as though Metcalfe also thinks in code, which is cool.) 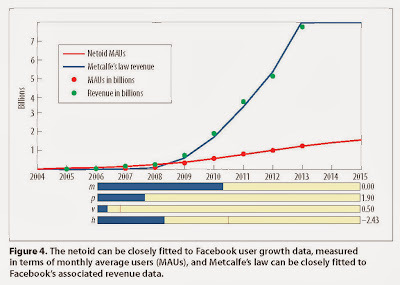 He plotted Facebook annual revenue (as the value V) for the last 10 years and used a Python slider to the Metcalfe's function to "get a pretty good visual fit to this data" as he displayed in the figure below reported in Computer magazine. Metcalfe also notes that a more elaborate model of network growth and value would involve using "nesting netoids." Fascinatingly, he observed that Facebook groups seem to be netoiding (a new verb) towards Dunbar's number, which is due to the anthropologist Robin Dunbar who theorized that humans have a cognitive limit on the number of people with whom they can maintain stable social relationships with this figure being about 150. And, since Facebook has about 1.06 billion users and 150 billion friend connections this implies an average of 141 friends per user. So, as we begin to celebrate the New 2014 Year, it is quite interesting that we are also marking technological advances that challenge and intrigue us in both theory and practice and that are still very much with us such as the Ethernet, which is now 40 years old! There is also a great interview with Bob Metcalfe, thanks to Charles Severance of Computer magazine, which can be viewed below.